My ex narcopath can be very charming, but also has a reputation for being a big jerk with many people. In fact, a lot of the people who attack and bully me for speaking out about how bad the abuse was will admit that they know he’s an abuser! But, they still support him and consider me the bad guy for telling the truth about just how bad he was in private. One of his enablers is a retired pastor who makes fun of me and attacks me for “sharing dirty laundry.” Shame on him. What kind of “man of God” would bully an abuse survivor and stand behind a known predator? Would he prefer the abuse stayed hidden so hundreds more women can be violated? 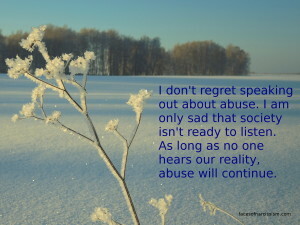 There are far too many people in society who would rather see an abused woman shut up and stay quiet, and keep the abuse private than go public about sociopathy. They are the reason that sociopaths and narcissists feel free and encouraged to continue targeting and destroying new victims.